All posts by: "Tamsyn Ross"
Pam and I were invited to place our work in Daisy Dot Vintage Interiors in Stockport. So if it’s near you then pop in and have a browse! As items sell we’ll be sending new ones so hopefully a regular turn over of creations for you to enjoy! Guardian Angels are back in Stock..
Our popular Guardian Angels are back in stock, they are the only Angel we currently make to order. They are made with soft silk to make them extra special ❤️. Suitable for all occasions, we just ask that you allow us the time to make them for you. Wizards are now back in stock, its certainly been a while. This year 2019 we plan to create them with a wider selection of colours. I like to use, natural items where possible and have been each combing on our Cornish beaches for the wooden staves. My partner Julian has been allocated chief wood cutter and has been cutting the wooden discs, which you’ll notice some of them stand upon upon! I’ll have to rethink when the wood supply gets too low and we freeze! 😂. Happy New Year… So it’s a new year and another chance to continue to share with you our needle felted creations. Firstly though a big thank you for all your amazing support, our journey wouldn’t be possible without all of you. January will be spent focusing on the Snowdrop flowers, with a range of Snowdrop fairies and maidens. We definitely won’t run out of these flowers as we’ve stocked up, so probably plenty for next year too! New fairies and mermaids will be added regularly so keep a close eye on our website or Facebook page Flower Faeries Bella. 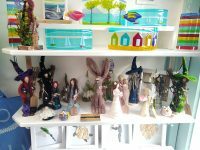 Our unique faeries and mermaids can now be purchased in Boscastle Farm shop, North Cornwall so do pop in if you’re passing! Mother’s Day charm can be added free of charge to make her special! Offer valid until Mother’s Day but don’t forget to let us know when you order! Christmas fairies are now on sale! All reduced and last posting date for first class signed for postage is Thursday 21st December.